Preventative Care — Dentistry 4 Kids Adults and Orthodontics Too! - Brushing and flossing everyday are fundamental to preventing decay. the brush should be aimed at the gums and angled to remove debris that collects between teeth and gums. Parents should assist with brushing and flossing until children can write their names in cursive. Brushing at bedtime is most important because bacteria is more active overnight. -Most people have been told, "Don't eat candy and you won't get cavities." However, recent studies show candy is only one part of the equation. When it comes to snacking, frequency can be as important as quality. Kids should be encouraged to finish all snacks quickly rather than "grazing" throughout the day. In addition, sports drinks, juice and milk are high in sugar and should be diluted or traded for water. Finally, never allow an infant to fall asleep while attached to breast or bottle. Milk left in the mouth overnight can trigger rapid decay. -Sometimes, a patient with little or no history of tooth decay will suddenly be diagnosed with several cavities between the teeth. This is usually a red flag that something diet or hygiene related needs to be addressed. However, it doesn't always mean "drilling and filling". There are now products available that can stop, and even reverse the progression of tooth decay; With early detection and diligent home use, some teeth will never need to be restored. The doctor will provide patients with all options at the office visit. -Sealants are an awesome weapon in the war against tooth decay. A thin material is applied to the permanent molars erupting around the ages of 6 and 12. The purpose is to "seal" over the chewing surfaces, thus preventing food from getting trapped in deep grooves where a toothbrush can't reach. 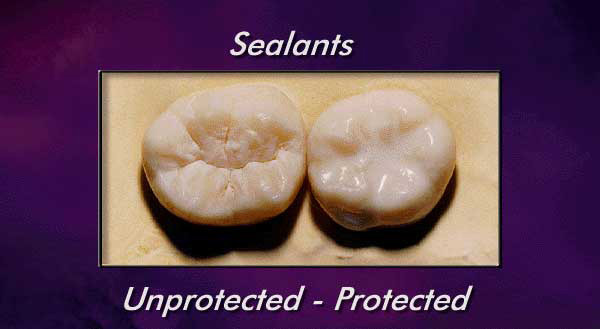 The ADA recommends sealants for prevention.